I’ve gotta say, it’s hard to be a lover of space, NASA and scientific exploration right now. With the end of the shuttle program around the corner, and a new bill to cut a huge amount of funding from NASA (article) things are looking rather down right now. Basically this would kill the James Webb telescope. I think this would be a terrible thing. Why should we invest? Well, the US prides itself on being number one in everything, even if we aren’t actually number one. Without continuing to push the frontier of research we will fall behind eventually. The article above, or another article mentioned congress killing the Super Collider in Texas, it would have been able to produce the novel results that the Large Hadroc Collider is producing now. The US would be the world leader in particle physics. We are starting to fall behind. Europe is going to be the world leader, and in the future we will be reading articles written by Europeans. We could be excellent teaching centers for particle physics for years to come, but the best of the best will not be in the US. The same could happen with astronomy. The Hubble Telescope led to over 9,000 scientific papers being published. Yes, that may seem like we were probably spending more money on research than just the money that we spent on Hubble, but remember we were also producing jobs to support those scientists that were writing the papers. The Webb Telescope is going to be significantly more powerful than Hubble. We have had some amazing picture of space and the universe around us because of Hubble. 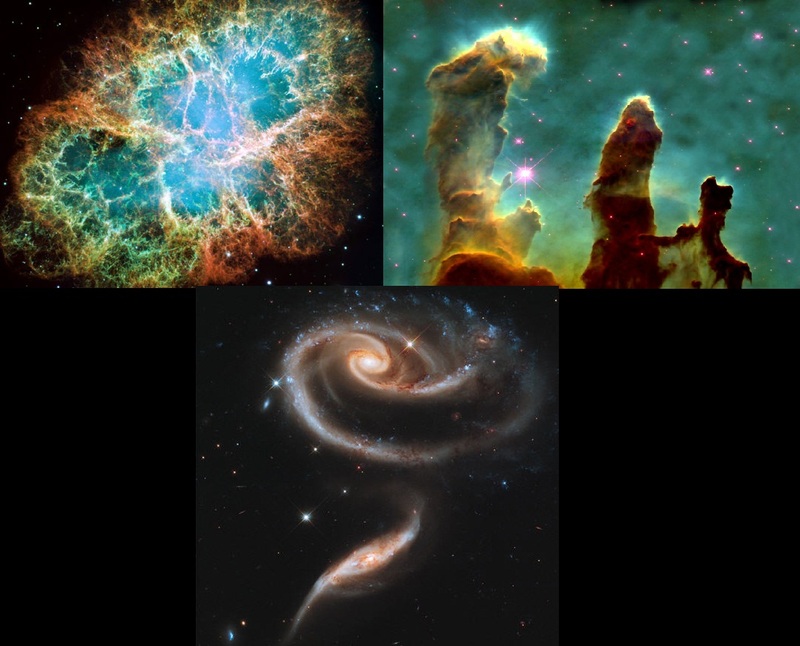 Pictures of the Crab Nebula, Pillars of Creation and the Rose Galaxy. See below. For me, these images instill a feeling of awe and wonder. Through the Hubble we’ve expanded our understanding of how the universe works and how dangerous of a place we live. The rose galaxy, or galaxies, are two galaxies colliding with each other. Our galaxy is actually predicted to collide with the andromeda galaxy in a few million years. We know this because of Hubble. We are also starting to realize that what we’re learning at the particle level may interact with the origins of the universe. For example, string/M theory also is a theory about how the universe was started. We need to be able to keep seeing back in time to understand how these theories interact with each other. This entry was posted in Culture, Innovation, Politics, Science and tagged communication, Science. Bookmark the permalink. Jazeker, if gov't won't fund this research, someone should. It's amazing stuff. The practical applications might not come for a hundred years. Well, if you look at http://www.sti.nasa.gov/tto/ you can see that there's a large number of nasa spin offs to date, so the practical application is much sooner than you'd imagine!